Located on Grand Bahama, Freeport is the 2nd largest city in the Bahamas, with a population of around 50,400 in the area, and 26,910 people in the city proper. Freeport has been a free trade zone since 1955, and will retain this status until 2054. Under the free trade agreement, known as the "Hawksbill Creek Agreement", businesses in the area are not required to pay any taxes. This agreement, along with the fact that Freeport Harbour is suitable for even the largest vessels, has been a major spur to economic growth - and Freeport now contains a cruise terminal, a container port, and Grand Bahama International Airport which handles 50,000 flights per year - with a total of around a million tourists visiting the area annually. If you're planning a visit to Grand Bahama Island, you'll find this book to be an invaluable guide. Everything you need to know to plan your visit is included. This guide includes up-to-date information about the best hotels, attractions, things to do, touring the islands, restaurants, the beaches, snorkeling, guided tours, hiking, dive sites, dive operators, fishing guides and much more. The book also includes up-to-date practical information: everything you need to know to make your visit to Grand Bahama Island a success. The Visitor's Guide to the Bahamas – Grand Bahama Island & Freeport is the most complete travel guide to the islands available. This is a double-sided map printed on light, waterproof and tear-resistant paper. The map divides the whole archipelago north / south. On one side, it covers the islands from Grand Bahama and Abaco to Eleuthera, Andros and the small northern islands of the Exuma Cays. Bimini Island and Isaac Island are shown as insets. This side on the map also has street plans of Nassau and Freetown / Lucaya, plus an enlargement presenting the island of New Providence in greater detail at 1:140,000. On the reverse is the southern part of the Bahamas group, from Eleuthera, Exuma Cays and Cat Island to Acklins Islands and Mayaguana, with Great and Little Inagua Islands shown as insets. On both sides of the map several small outlaying atolls are also included as insets. The map shows the road network on the islands, with symbols indicating various places ot interest including beaches, scuba diving / snorkeling / surfing sites, national park and other protected areas including wild life and bird sanctuaries, golf courses and other recreational facilities, marinas, etc. Swamps or mangrove areas, and in the coastal waters coral reefs are marked. Latitude and longitude lines are drawn at 0.30º intervals. The two street plans and the enlargement of New Providence are also overprinted with various tourist facilities and places of interest, including selected accommodation. Each side of the map has a separate index. Along with our beautiful, clean and pristine beaches Freeport, Grand Bahama, Bahamas has so much to offer the world. In the West, you can eat great native foods from the real down home island restaurants and sea food vendors that line our ocean front. West End is known for it’s great Conch salad. Smith’s Point is home to the world famous Fish Fry. Every Wednesday night you can enjoy fresh fried fish, conch fritters and lots of other great Bahamian delicacies. It is truly a Grand Bahama event. There is a beautiful garden that takes you to a special place where stress is not allowed. The waterfalls, birds, ducks, turtles and walking trails transport you to a place of relaxation that you hate to leave when it’s time to go. The food is another story—it is better than great. It is fantabulous! In the East, we have a National Park as well as great opportunities for Bone Fishing and enjoying delicious native food. For those of you who have visited before—thank you and please come again. For those of you who are here now—enjoy your stay. For those of you who have never visited—take the trip of a life time and come to Freeport, Grand Bahama, Bahamas. Freeport, Grand Bahama Uncensored: 11 Things to do in Freeport, Grand Bahama is a quick compilation of places to go, and things to do not on the regular tourist lists. It includes places to eat, shop, and do that are not typically included in regular tourist promotions. This list is compiled from a local’s perspective, and allows the unfamiliar visitor an opportunity to choose more options of things to do and places to go. It sets a realistic view of what to expect, and includes a few snippets of historical information as well. Planning a visit to the Bahamas? 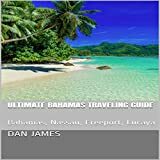 If so, you'll find this book to be an invaluable guide for visitors to the Islands of the Bahamas, this Visitor's Guide is three complete guides in one: Visitor's Guide to the Bahamas - Nassau; Visitor's Guide to the Bahamas - Grand Bahama; Visitor's Guide to the Bahamas - The Out Islands. Everything you need to know to plan your visit is included. Includes up-to-date information about the best hotels, attractions, things to do, touring the islands, the beaches, snorkeling, guided tours, hiking, dive sites, dive operators, fishing guides and much more. The book also includes up-to-date practical information: everything you need to know to make your visit to the Bahamas a success. The Visitor's Guide to the Bahamas is the most complete travel guide to the islands available. The Out Islands - The Abacos, Exumas, Eluethera, Long Island, Cat Island, the Inaguas, Bimini, the Berry Islands, Mayaguana Island. The GRAND BAHAMA TREASURE & Tour Guide is written primarily as a valuable information source for visitors to Grand Bahama Island, and to anyone interested in knowing about the island or promoting it. The perennial question, ‘what is there to do on Grand Bahama?’, or the statement, ‘there is nothing to do on Grand Bahama’ will be answered and addressed by the book. Get travel tips on visiting the Bahamas, Nassau, Freeport, and Lucaya.